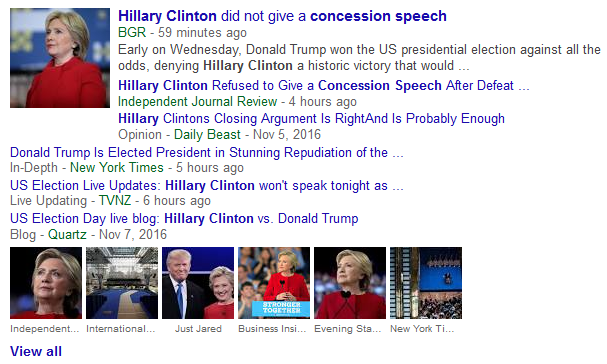 > 11:54 AM – Well, well, well… Hillary seems to be stepping aside. Will she stick to it? Will her supporters accept defeat? Will the state governments accept the result? The article in which this quote appeared was about the plans the globalists had for the Rio Olympics. Extensive exposure caused them to back off of those plans, though, which in turn caused them to back off of their September plans (either that or I was dead wrong about both). In fact, they’ve delayed or canceled every part of their plan they possibly could since they abandoned Greece’s defection to the BRICS last summer. Trump’s election is a key element of their endgame, though, so there was no way they could skip it without throwing in the towel completely. And here we are. Let’s see if we can make them put this off for another generation. The human race needs time to wise up and stop being so gullible, and in the Age of the Internet, that is entirely possible. Humanity now has a highly efficient central nervous system and a collective brain. Let’s use it. > That the “evil Western globalists” will do anything, including taking us to nuclear war, to survive. And with you being programmed to believe that, they will indeed take us to war before Trump’s inauguration. Since a war between East and West (BRICS vs. G7) will halt all financial transactions between the two, a wrenching economic collapse will accompany the conflict. 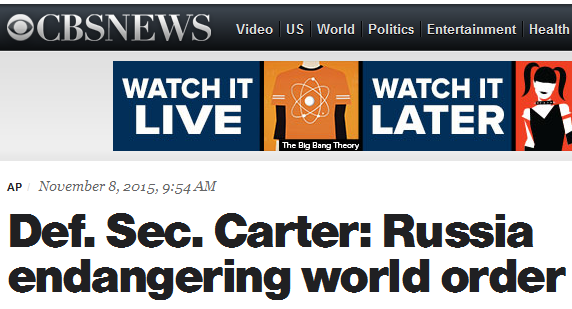 And once the nuclear missiles start flying, that’s when the Lubavitchers’ fake messiah bullsh*t will kick in. You can read about their prophecy fulfillment strategy in End Times Programming. Although they’ve already missed their first deadline (which was in September), that doesn’t necessarily mean they’ve abandoned all variants of their plan. Prophecy is indeed bullsh*t, but when the global bankster elite are footing the bill, a nice show of fulfilling it can be staged. 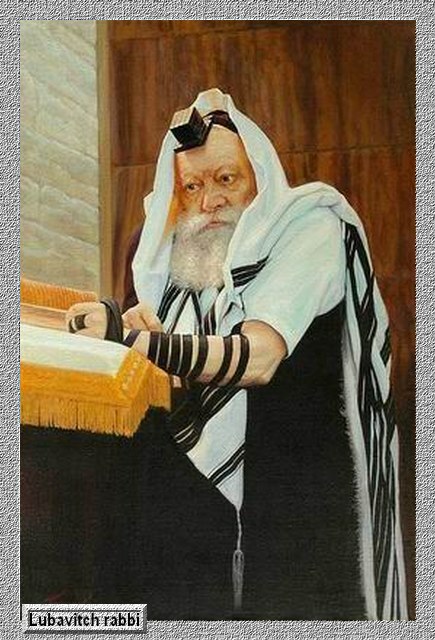 By the way, can you guess who the Lubavitch messiah will be? Find out here. 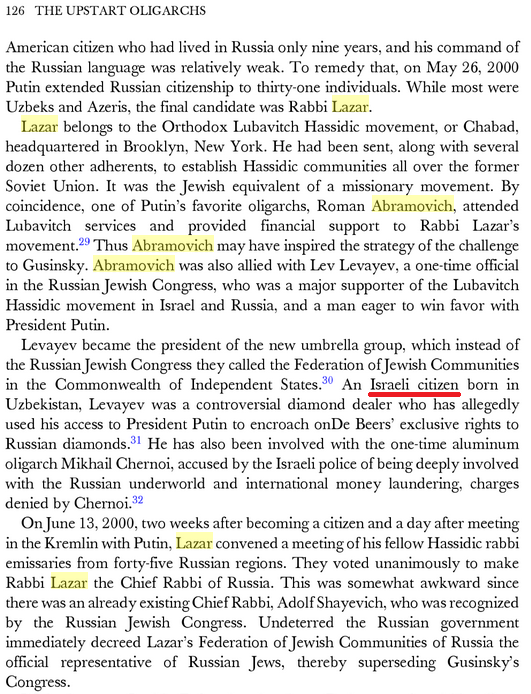 You’ll read about Trump and Putin’s ties to Chabad-Lubavitch, as well as what Chabad-Lubavitch is, a little further down this entry. > rumblings in two or more state governments about overriding the popular vote to install new electors. > 8:47 PM CST – So far, the election is closer than I expected. But as I think about it, a tight race makes it easier to claim that Russian hackers (or Soros voting machines) made the difference. Trump is still going to win, sooner or later. > 9:03 PM – I continue to find it curious how slow Florida has been about announcing the last 8% of its vote. 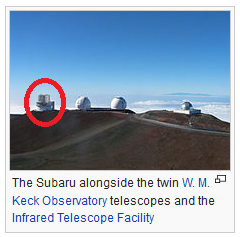 Could this be a state where mischief will be claimed? > 1:34 AM – Well, I was right about Trump winning, but I’ve known that the Republican candidate would win since early last year. At that time, I thought Rand Paul would be the nominee, but I didn’t know about the Chabad-Lubavitch angle back then. Read this April 2015 entry and substitute “Donald Trump” wherever it says “Rand Paul” to see if I got it right. 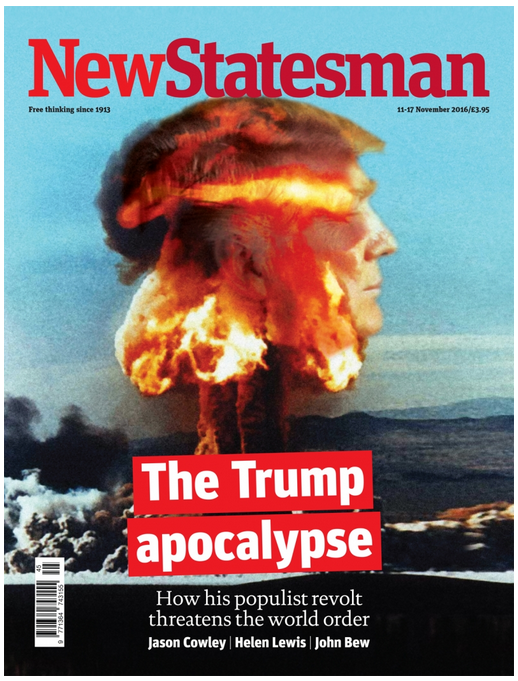 Also have a look at How Hillary, Trump and Putin figure into the launch of the New World Order to understand why I was so certain about the election’s outcome. I was off, though, in predicting a landslide. It does make more sense for them to keep it close. Now we can look forward to potential drama in the electoral college, over-the-top Democrat theatrics, and loads of faux-truther bullsh*t about “desperate globalists trying to overturn the election result.” When all is said and done, though, the globalists’ boy will be left standing. The next act of the Lubavitch messiah show is about to begin. 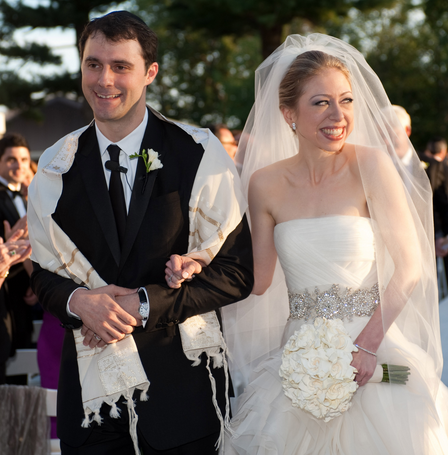 Don’t you find it interesting that among all the people who ran for the Presidency on both the Republican and Democrat sides, the two who had intermarried with the elite New York Jews ended up winning? 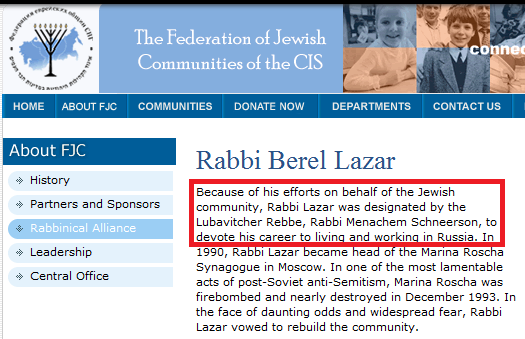 >>> Federation of Jewish Communities of the CIS (FJC) is a Jewish organisation dedicated to restoring Jewish life, culture and religion in the Commonwealth of Independent States (CIS), the former Soviet Union. 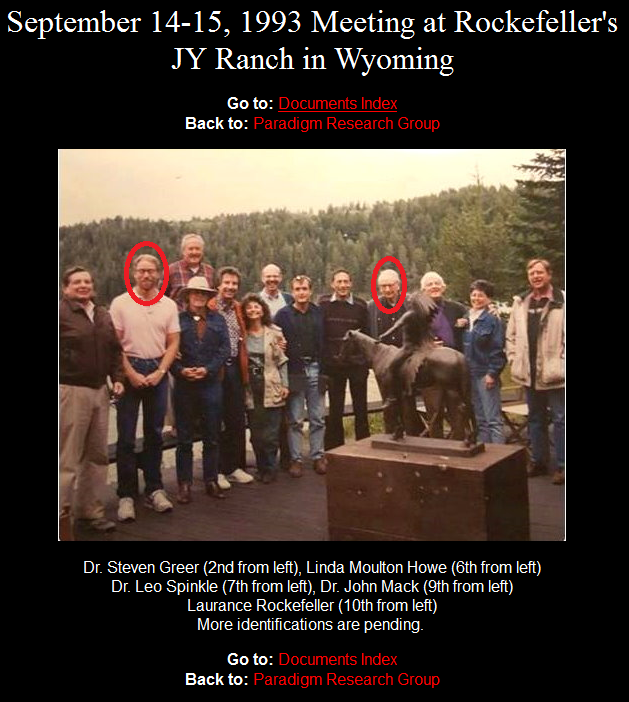 The FJC was founded on August 1, 1997. 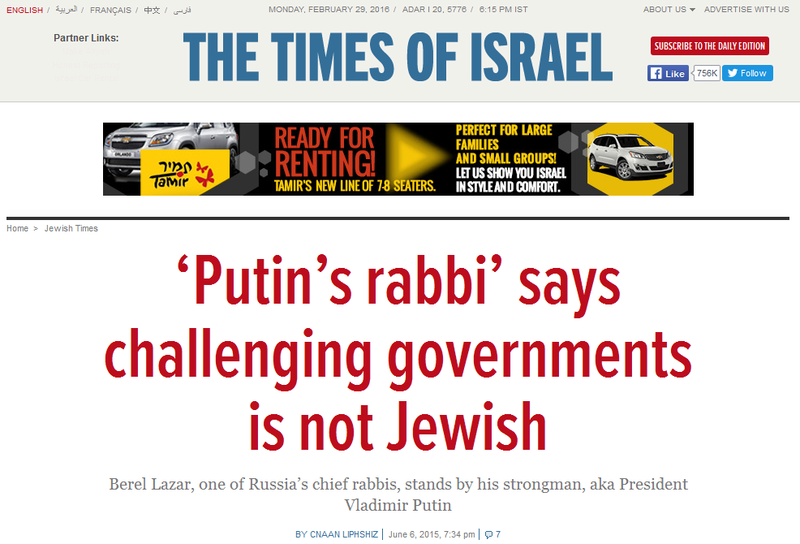 Lazar was Chabad’s chief envoy to Russia before staking claim to the title of chief rabbi in 2000. 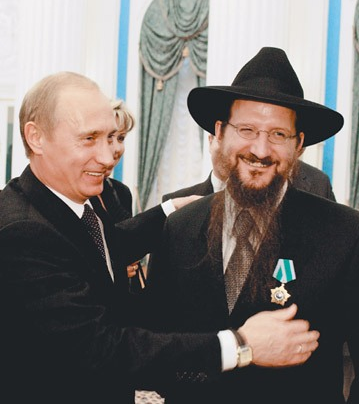 That’s when he quit the Russian Jewish Congress, an umbrella group, after the organization’s founder, Vladimir Gusinsky, and Russia’s other chief rabbi, Adolf Shayevich, criticized Russia’s war in Chechnya and its alleged human rights abuses — including the alleged targeting, by anti-corruption authorities, of political dissidents. 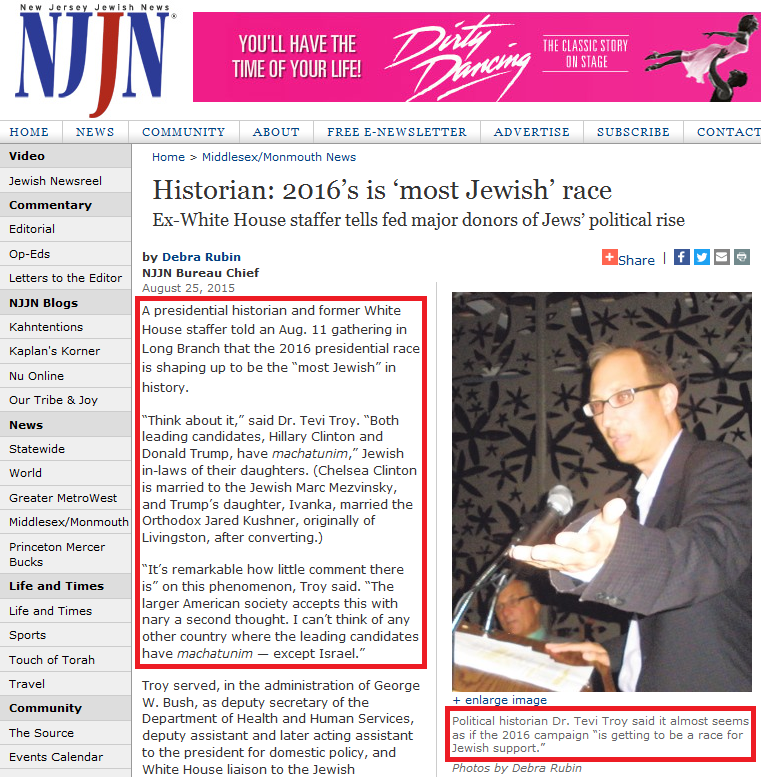 So the same Jewish group that brought Putin to power in Russia is now bringing Trump to power in the United States. 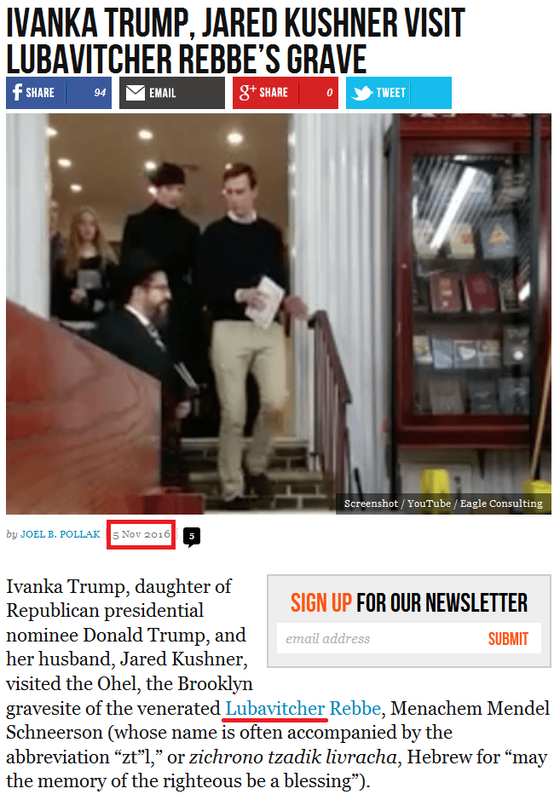 “A 35-year-old real estate developer, investor and newspaper publisher, Mr. Kushner derives his authority in the campaign not from a traditional resume but from a marital vow. 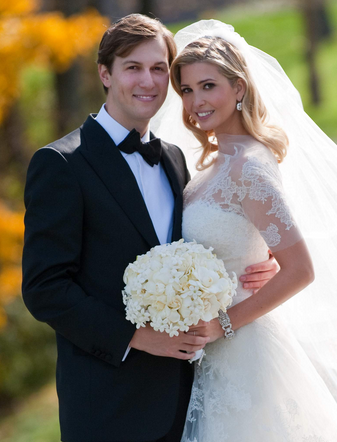 He is Mr. Trump’s son-in-law. “Donald J. Trump has asked his son-in-law, Jared Kushner, to begin quietly working to put together a blueprint for a transition team should he win the White House in November. 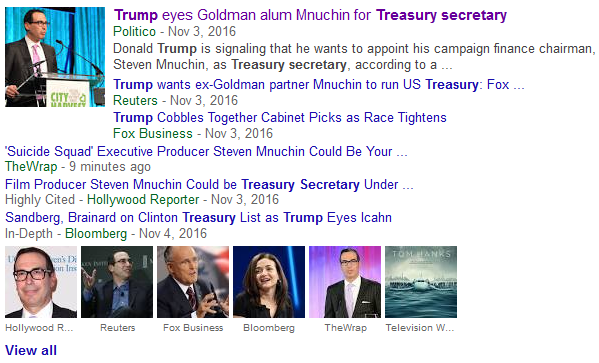 It should come as no surprise that Trump is in partnership with the Jewish financial elite given his career background. Although naive sleepers seem to think he’s independent of the Money Power “since he has his own money,” they fail to understand how he got it. 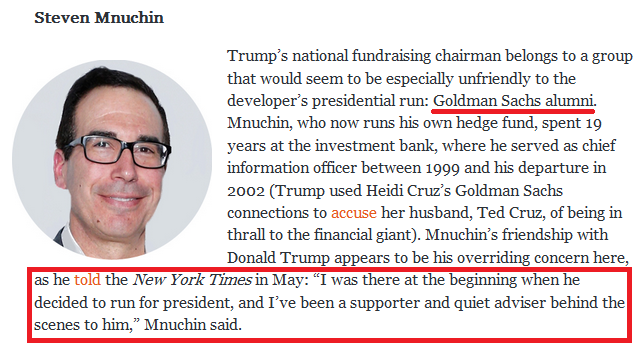 He didn’t do the real estate megadeals he’s know for by using money from his own bank account; he borrowed the money from the big banks and finance houses. 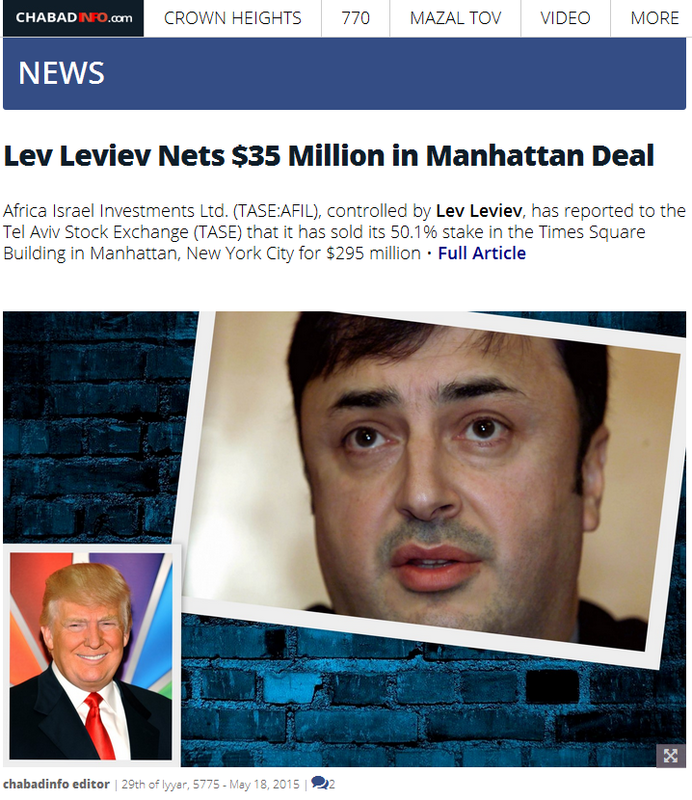 There is simply no way he could be a big mover and shaker in real estate, especially in a Jew-controlled city like New York, without being in the good graces of the Money Power. He’s their boy. But once they get him into office, they’ll flip the script and use him to scare the common Jews to the killing fields of Israel. 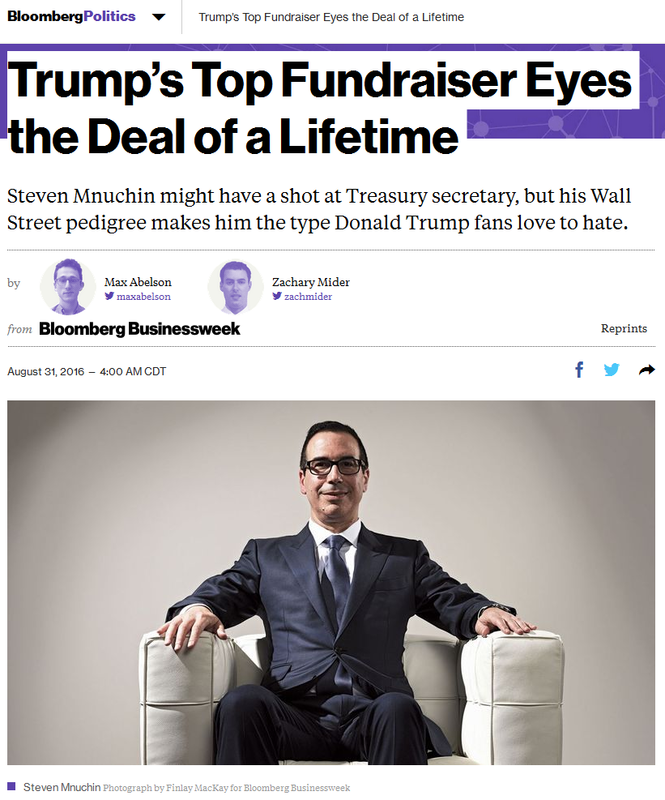 And if we look at Mnuchin’s Wikipedia bio, we also see connections to George Soros and Eddie Lampert (the Skull and Bones member and Chabad operative who has strip-mined Sears and Kmart to oblivion). If you think Donald Trump isn’t a globalist, you are still asleep. Donald Trump is going to win the US presidential election, even if he appears to lose it at first. Why? Because both he and Hillary have well-defined roles vis-a-vis the globalist rollout of the New World Order, and Trump is the scripted winner (read How Hillary, Trump and Putin figure into the launch of the New World Order). So given the inevitability of Trump’s presidency, this entry will explore the two scenarios by which he’ll win the election: the landslide scenario and the electoral college scenario. 1) The globalists need Trump in office next year to help Putin “reform” the UN after the coming war, so they’ll want to establish his clear and legitimate claim to the Presidency before all hell breaks loose in the coming few months. This means he’ll be announced as the winner by a wide margin. If they went the other way and announced a Hillary victory, I doubt they’d have enough time to legitimately reverse the result before the March debt limit deadline. 2) Since the globalists are trying to shift the nations to the “political right,” they will let the Democrats be the ones to dispute the election and create chaos, just like they are having their leftists create chaos in Europe, Venezuela, Brazil, etc. 3) All the talk in the news about Hillary’s war with the FBI and the FBI’s internal conflict between “honest” agents and political hacks is preparatory propaganda for the coming “white hat rebellion” within the US security services and military. 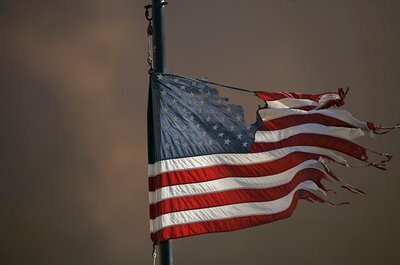 Trump will win in a landslide, but the Democrats will cry foul, saying, “The polls going into the election were tight, so the only way this lopsided victory could occur is if the Russians hacked the voting systems on behalf of Trump.” They will then go on the warpath against the Republicans and allow the government to shut down in December. The food stamp riots that will follow will lead to Obama’s declaration of a national emergency and his rule by executive order. According to the globalist script, the “honest” officers in the security services and the Pentagon will know that the Russian hacking claims are bogus, and they’ll see the Democrats’ actions as a coup aimed at overturning the results of the election. This will lead them to stage a counter-coup and take down the top Democrats to “restore Constitutional order.” And with Obama and Biden under arrest, they’ll have to follow the succession rules and install Paul Ryan as interim President. 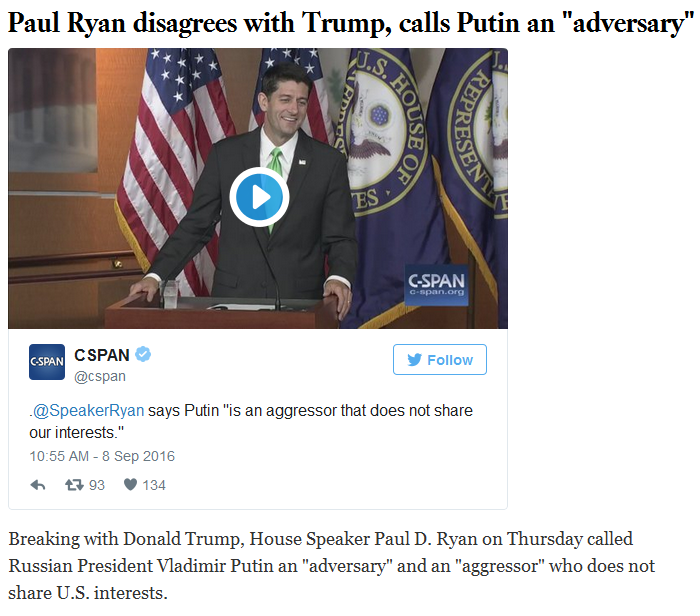 The designated “bad guys / scapegoats” in the globalist drama, the Zionists / Neocons / Nazis, will then join forces with Ryan (who has a reputation as a closet Democrat and “Western” globalist) to make a “desperate last attempt to salvage their evil Western globalist agenda by starting World War 3.” The war will be short, and America will not fare well. To see what happens after that, read Update 22, which has been appended to this entry a little further down. 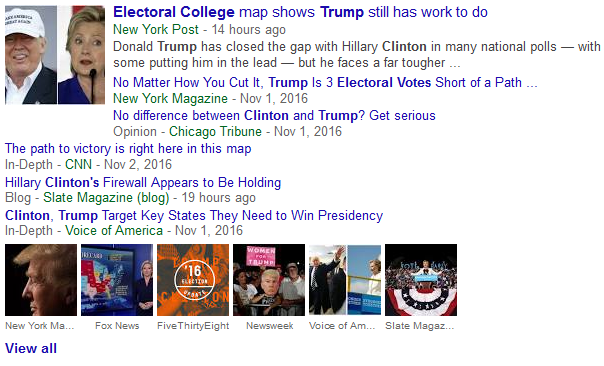 …From a Google News search for clinton trump electoral votes. This electoral angle actually sets up a high probability variation of the “Trump wins” scenario in which Trump wins the popular vote and Hillary wins the electoral college vote due to voter fraud in one or more electorally significant states. 1) On the night of the election, Trump will decisively win the popular vote, but narrowly lose the electoral vote. This will result in Hillary initially being announced as the winner. 2) Very soon after the election results are announced, and possibly even before election day, the phony intelligence agency / Pentagon “counter-coup” will leak clear, unimpeachable evidence that Hillary’s people shaved votes in one or more key state(s) that she supposedly won. The total electoral votes of the “stolen state(s)” will have been enough to sway the outcome of the electoral vote. Thus, it will be shown that Hillary stole the election. 3) This will supercharge the post-election conflict between the Democrats and the Republicans. The more reasonable Democrats will be deeply troubled by the evidence against her, but many will still back her. Even supposedly Trump-hating Republicans will join the fight out of hatred for Hillary and to claw back any congressional seats that were stolen by the vote shaving. Their argument will be undercut, however, by the unmistakable nature of the evidence. 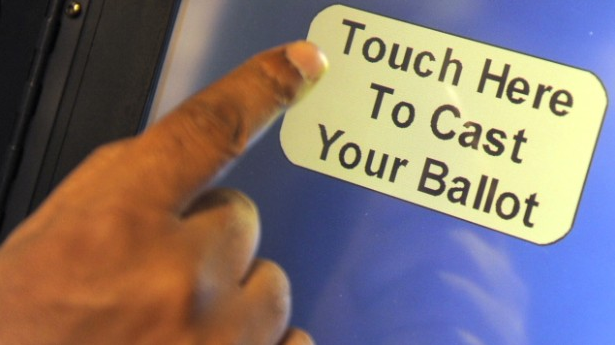 The globalist election engineers will be sure to release information that is beyond reproach. Despite this, the conflict will go on for weeks, and it will give rise to everything else I’ve outlined in the remainder of this entry. So when will Hillary, Obama, Biden, and other top Democrats be arrested, you ask? Probably sometime after the government shutdown on December 10. The “counter-coup” might arrest them right after the shutdown in order to “save the nation from disintegration,” but they might also wait till early January to let the food stamp riots create more drama and justification before they make their move. Take the time to watch it. It talks about the coup, the counter-coup, and the phony white hat rebellion I warned about. And given how Alex Jones talks at the beginning of the video, it looks like they’re rushing out their narrative ahead of schedule so they can get it in front of people before our information can reach them. 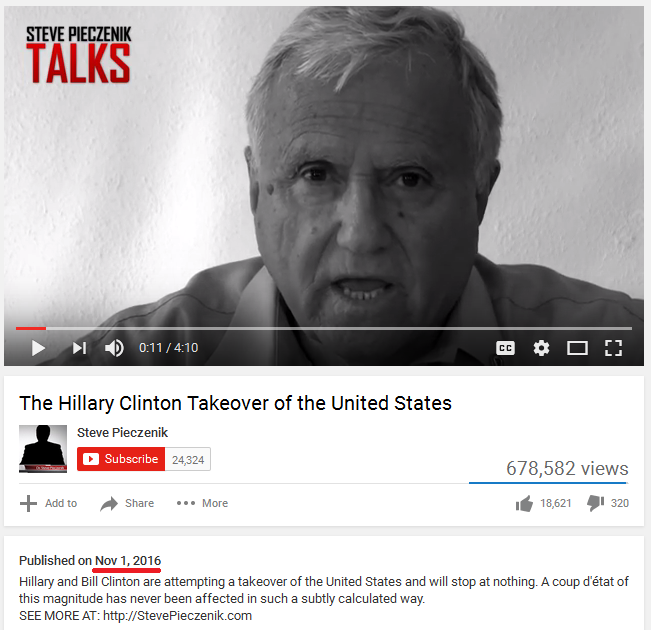 As for the guy who starts talking at the 1:37 mark, Steve Pieczenik, I’ll show you some things about him tomorrow. 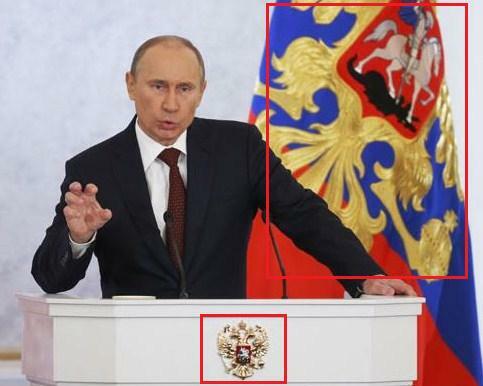 His globalist pedigree is quite obvious. 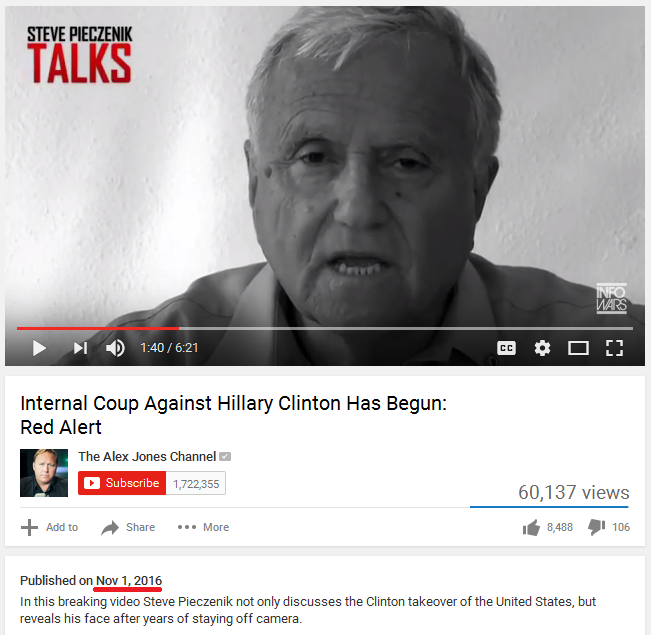 Pieczenik has consulted with the United States Institute of Peace and the RAND Corporation. So why is Pieczenik being interviewed by Alex Jones? To help sell the narrative that the “evil Western globalists” are being defeated by “patriotic, benevolent” spooks and the oligarch Donald Trump. It’s all about setting people up to accept the Rockefeller/Kissinger- planned, BRICS-fronted, “reformed” UN-centered New World Order after the “bad guys” / scapegoats fall. > I am telling you that Alex Jones, Steve Pieczenik, and Julian Assange are all globalist agents performing limited hangout and propaganda operations to sell you on the real New World Order. Which view is more realistic? Who is telling the truth here? 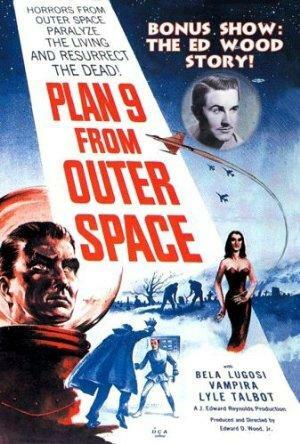 Since the globalists are accelerating their rollout, they might also go with a more abbreviated form of their plan. I’ll keep an eye out for any changes. As you read the article, remember that it’s coming from a globalist minion, and he’s working from a script. Will Wikileaks’ “Phase 3” release information related to voting fraud in keeping with the electoral college scenario? Will all these new releases result in the Trump landslide scenario? After reading this entry, you might wonder why I so confidently predict a brief Paul Ryan presidency and a quick “World War 3” between the election and inauguration. It all has to do with the known objectives of the New World Order crowd. > A “reformed” and strengthened United Nations with Vladimir Putin as its de facto or de jure leader. > A “reformed” IMF / World Bank (which are the financial organs of the UN), with a Chinaman – most likely Zhou Xiaochuan – at the IMF’s helm. > An IMF SDR with gold added to its valuation, and it will start taking on the role of the primary global reserve currency in replacement of the dollar (on its way to becoming the global consumer currency in a few short years). > a detailed plan to “restore order and confidence” were already prepared and ready to be implemented. > The Republican versus Democrat conflict that will follow this election is intended to trigger a partial government shutdown and the food stamp riots that will follow. This will create an urgent domestic crisis in the US that will demand action. 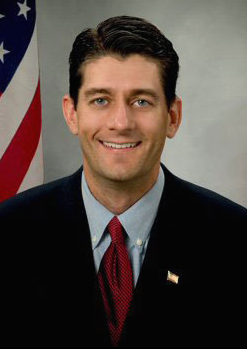 > The globalist-staged “counter-coup” that will take that demanded action is intended to clear out Hillary, Obama, and Biden so House Speaker Paul Ryan can be put in place as the caretaker president before the inauguration. This is necessary because Obama seems unwilling to let the war go forward; Ryan will happily do so. The war will be short so it can end before Trump’s inauguration. It might even end shortly after his inauguration, like the Iranian hostage crisis did after Reagan took office. > Trump’s presidency is needed to help Putin launch the globalist-planned UN overhaul that will bring the NWO to completion. They will sell the whole thing as a return to national sovereignty, but it will actually be just the opposite. The economically weakened nations of the postwar world will be reliant on the globalists’ multilateral institutions (the UN, IMF, BRICS Bank, etc.) for recovery. It is a spiderweb from which there will be no escape, except when the fake messiah comes. On an unrelated subject, a reader from Germany contacted me requesting clarification on some things, so I’ll share her questions and my answer in case others need more clarity too. How can the Chrislam be the intended companion religion to the BRICS-fronted NWO, when all the parties which belong according to you to the “Mises”-Mafia fight against the Islamisation of Europe and are all for shutting the boarders? Is it not rather so that the Chrislam is intended by the decoy NWO and shall push the people of Europe right into the arms of the opposition parties like FN, AfD (Germany) and others? Pls elaborate further. Do you also have an idea why in particular the German chancellor Merkel accelerated the Islamisation of Europe and wanna force the rest of Europe to accept Moslems in high numbers in their countries? A: Allow me to break down the globalist religious agenda and explain the strategy of tension and release. 1) The religion of the decoy NWO’s “evil Western globalists” is being portrayed as Satanism, and according to the globalist narrative, the Satanists are using the Muslims to destroy the Christian Church and Christian civilization. This is why the (pre-reform) UN, the EU, Merkel and Obama are bringing in all the Muslim refugees. Since these sweet-sounding sentiments are coming from the mouths of the same people who pitted them against each other in the first place, it is a deception of course. 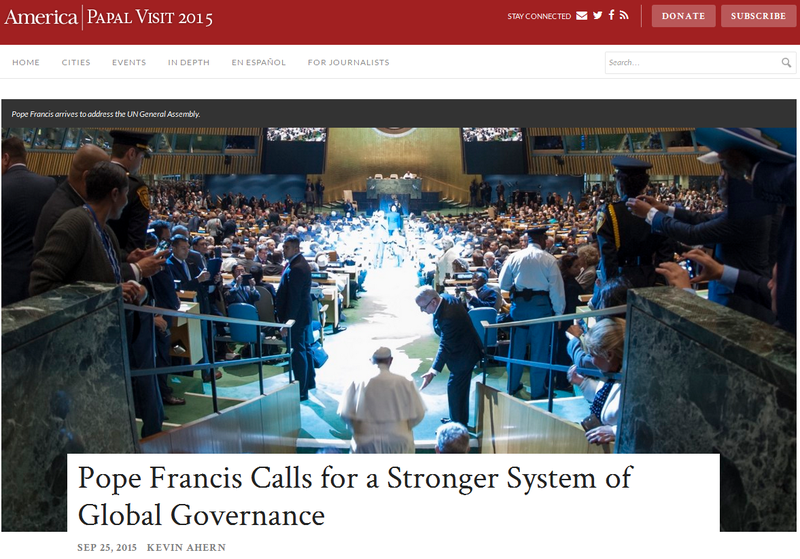 What they’re really trying to do is create a global universal church to go along with the Global Roman Empire (the “reformed” UN). But like the political UN, the Spiritual UN will turn authoritarian very quickly, and the “faithful” of the various religions will get cold feet and rebel. This will lead to the scripted “Armageddon” battle. 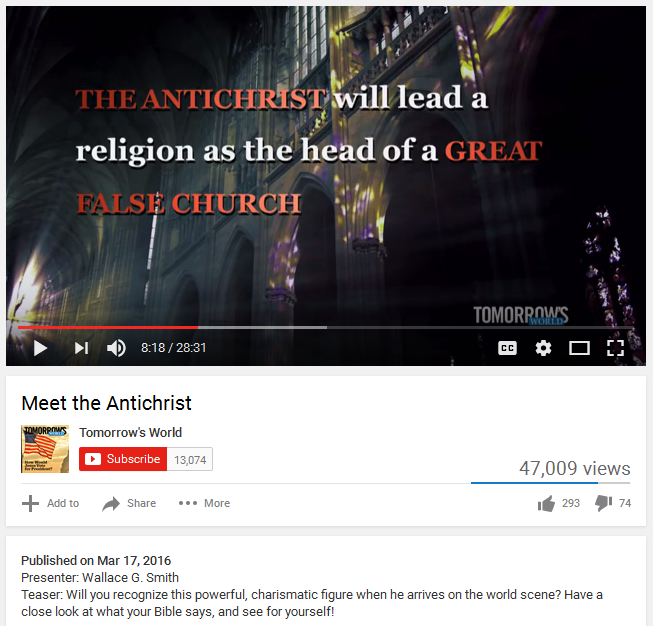 3) The religion of the post-Armageddon, post-NWO world is scripted to be a Kabbalized version of Christianity led by a figurehead god-king they’ll call “Jesus Christ.” The ultimate goal of any power-hungry gang is to rule over the whole world as gods – to have people accept everything the gang says as though it were the very word of “the almighty creator.” By destroying faith in democracy with the NWO meltdown and installing a god-king with a “magic show” put on by sequestered technology, they believe they can achieve this goal. So the “thousand-year Kingdom of Christ” is the end result the globalists are seeking. Beyond this religious agenda, there is the general strategy of tension and release that is at play. The globalists are having their Western minions shove the Muslim refugees down people’s throats in order to get the populace frustrated, furious, and ready to lash back. Once people are ready to blow, they present them with controlled opposition figures like Trump and Le Pen to provide a channel through which that desire for vengeance can be sated – a channel that the globalists can control and direct to suit their purposes. You can read more about this in The Illuminati strategy of tension and release. Hopefully that answers the reader’s questions. 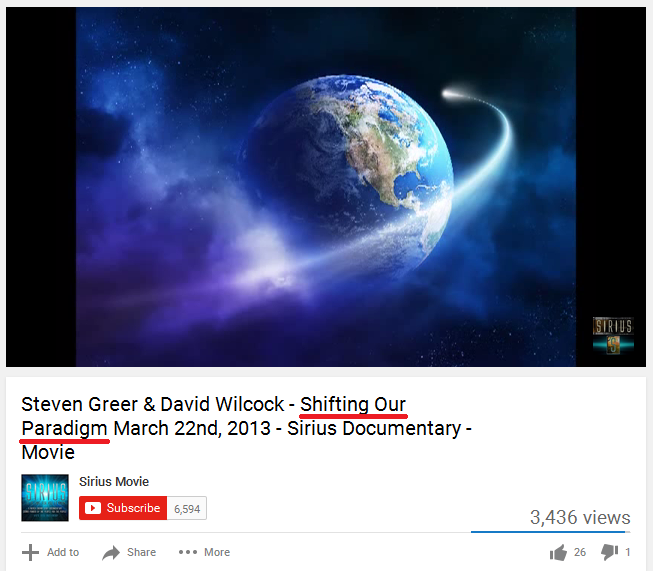 The previous postscript talks about the globalist religious agenda, which has three phases: 1) the Satanism of the decoy “evil Western NWO,” which will give way to 2) the “Chrislam” / One World Religion of the real, BRICS-fronted NWO, which will give way to 3) the Kabbalized Christianity of the post-NWO “Kingdom of Christ,” which is the ultimate end the globalists are seeking (they want to rule humanity as gods without the impediment of democratic structures). Given all this, allow me to make a prediction: Once the current crisis has passed and the UN is “reformed” into the real New World Order in its aftermath, watch for Alex to freak out and start railing against the new UN, Vladimir Putin, and the One World Religion that will rise with them. The next phase of his job is to point them out as the new “bad guys” and prepare the public to accept the faked “Kingdom of Christ” once the globalists get around to that phase of their plan. For more information on Alex Jones and his role in the globalists’ artificial prophecy fulfillment effort, read Alex Jones and the Christ Conspiracy. And to understand the difference between the decoy Western NWO and the real Eastern NWO, read Understanding the NWO Strategy (reading it is essential to understanding what’s really going on here). 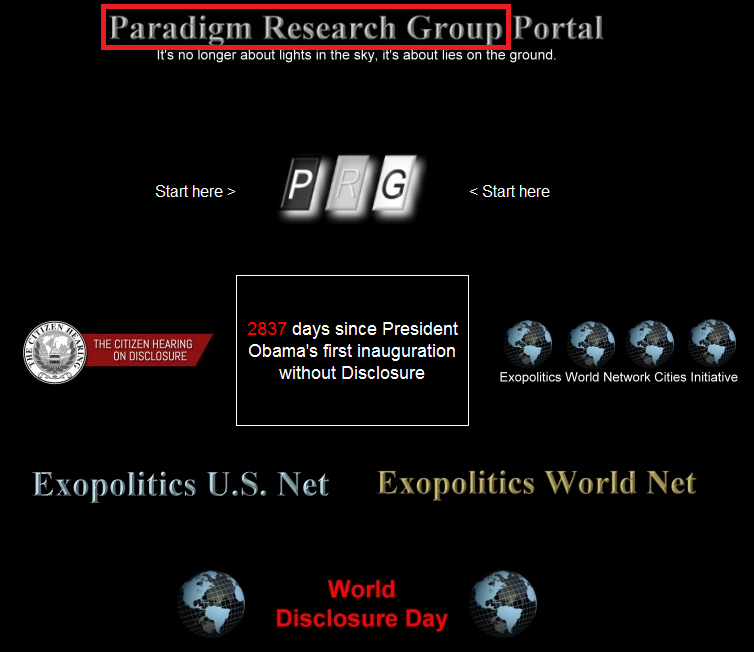 This entry was posted in Globalist Agenda Watch 2016 on October 31, 2016 by kenneth. While I was writing How the Kabbalist Jews took over the Roman Catholic Church through the Jesuit Order, I couldn’t help but notice that it was during the Second Vatican Council (11 October 1962 – 8 December 1965), when the Crypto-Jews were remaking the Roman Catholic Church, that US President John F. Kennedy was assassinated (on 22 November 1963). Kennedy was the first and only President to have been a Roman Catholic, and as such, he was perhaps the only man in the world who had sufficient power to interfere with the takeover (both of the Church through the Crypto-Jewish Jesuits and of the United States through the Jews’ Federal Reserve Bank and Communist front). 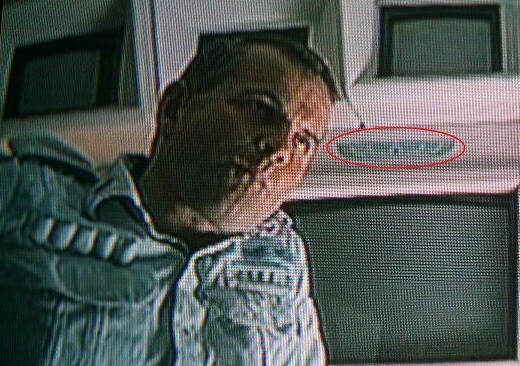 Upon noticing this, I decided to do a little sniffing around. On June 13, 1938, Kennedy met with Herbert von Dirksen, the German ambassador to the United Kingdom, in London, who claimed upon his return to Berlin that Kennedy had told him that “it was not so much the fact that we want to get rid of the Jews that was so harmful to us, but rather the loud clamor with which we accompanied this purpose. [Kennedy] himself fully understood our Jewish policy.” Kennedy’s main concern with such violent acts against German Jews as Kristallnacht was that they generated bad publicity in the West for the Nazi regime, a concern that he communicated in a letter to Charles Lindbergh. As fiercely anti-Communist as they were anti-Semitic, Kennedy and Astor looked upon Adolf Hitler as a welcome solution to both of these “world problems” (Nancy’s phrase)….. Kennedy replied that he expected the “Jew media” in the United States to become a problem, that “Jewish pundits in New York and Los Angeles” were already making noises contrived to “set a match to the fuse of the world”. By August 1940, Kennedy worried that a third term as the President for Roosevelt would mean war. As Leamer reports, “Joe believed that Roosevelt, Churchill, the Jews, and their allies would manipulate America into approaching Armageddon.” Nevertheless, Kennedy supported Roosevelt’s third term in return for Roosevelt’s promise to support Joseph Kennedy Jr. in a run for Governor of Massachusetts in 1942. However, even during the darkest months of World War II, Kennedy remained “more wary of” prominent American Jews, such as Associate Justice Felix Frankfurter, than he was of Hitler. In 1938, Lyndon B. Johnson, then a Congressman and later the 36th President of the United States of America, worked covertly to establish a refuge in Texas for European Jews fleeing Nazi Germany. Johnson helped hundreds of European Jews enter Texas through Cuba, Mexico and South America. So Kennedy, who was a Roman Catholic traditionalist and an anti-communist from an “anti-Semitic” family, was killed and replaced by a man who was favorably disposed towards the Jews and wouldn’t get in their way. 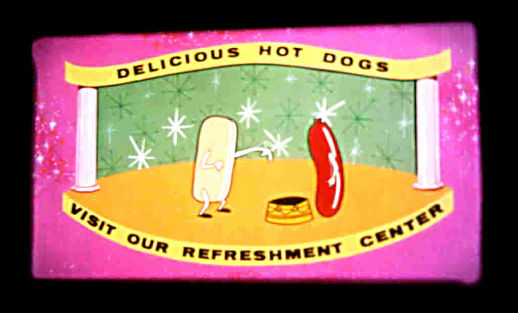 Of course, there is much more to the story than this, and I’ll add more information to this entry over the weekend. > In the centuries preceding the 20th, the Jews gained the upper hand over the Western Christian royals through banking activities and their increasing control over the administration of royal power. They also infiltrated the Roman Catholic Church through the Jesuit Order and grew like a cancer within it (so a new Jewish cancer was metastasizing within an old Roman tumor). > In 1917, they took over Russia by financing and directing the communist revolution. 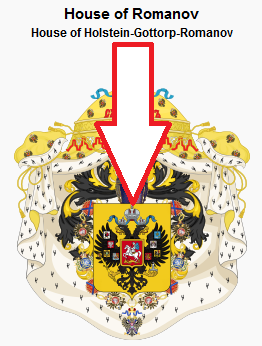 They then took control of the Russian royals and the Eastern Orthodox Church using a brute force approach. > In 1949, they took over China by financing and directing the communist revolution. The takeover of China was not about revenge against Rome, of course; it was about gaining dominion over the most populous nation on Earth in pursuit of their global ambitions. > In 1965, two years after Kennedy’s assassination, they completed their Jesuit-fronted takeover of the Roman Catholic Church, which was demonstrated by the promulgation of Nostra aetate. 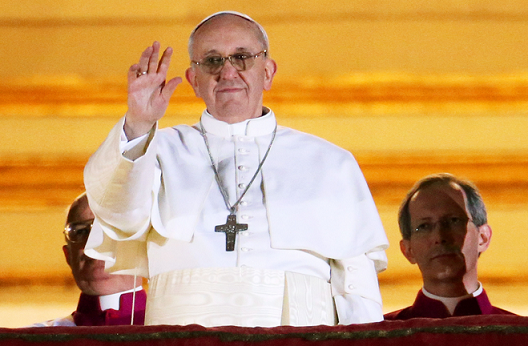 The Catholic Church was the last major Christian/Roman edifice to fall to Jewish power. 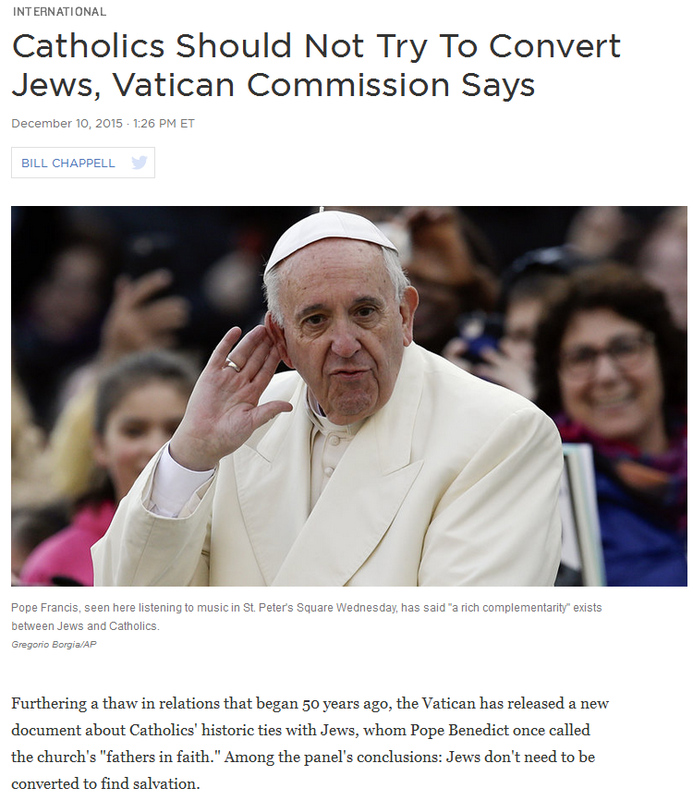 The Crypto-Jews later went on to elect a Jesuit Pope, Pope Francis, to serve as the Final Pope and trigger their “Armageddon” scenario that Joseph P. Kennedy talked about. You’ll be seeing how that plays out over the next 3.5 – 7 years. I’m not sharing this with you as a tale of “good guys” versus “bad guys.” This is a tale of “Christian monsters” versus “Jewish monsters” – there are no good guys in this story, just two different mafia groups battling for control (a battle that the Jews won). When I talk about the Jews behind all this, I’m talking about the Jewish “haves,” not the Jewish “have nots.” According to the plan of the haves, the have nots (including the minion-level Zionists) will be gathered in Israel over the next few years, then slaughtered. This will be done to create the appearance that Jewish power has been completely broken for all time. But the haves will live on as Kabbalized “Christians,” and their power monopoly will remain intact. This entry was posted in NWO on October 28, 2016 by kenneth. 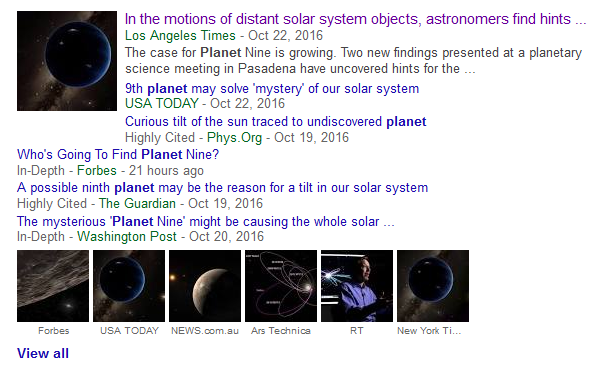 When I first started reading it, I thought it was one of those satirical articles that sometimes get mistakenly passed around as real news. But it’s the real deal. 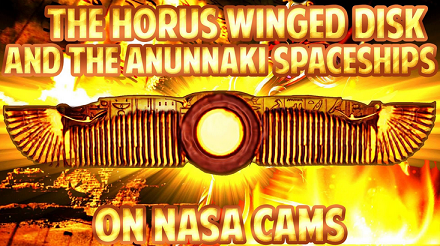 It even offers a video that shows Hillary talking about UFOs, and it contains a link to a newspaper article in which Hillary suggests that we may have been visited by aliens already. 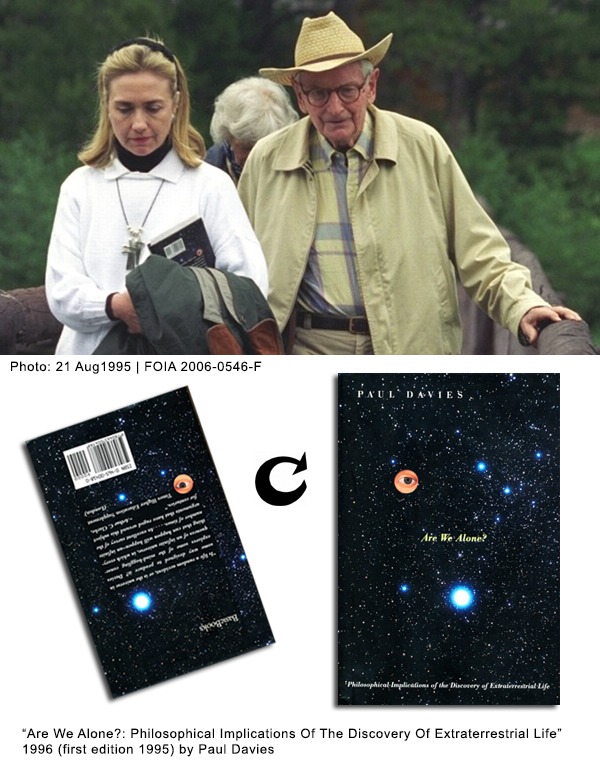 …Hillary conspiring with Laurance Rockefeller on UFOs in 1995 (Laurance was one of the architects of the New World Order, and he funded the startup of the UFO disclosure movement). 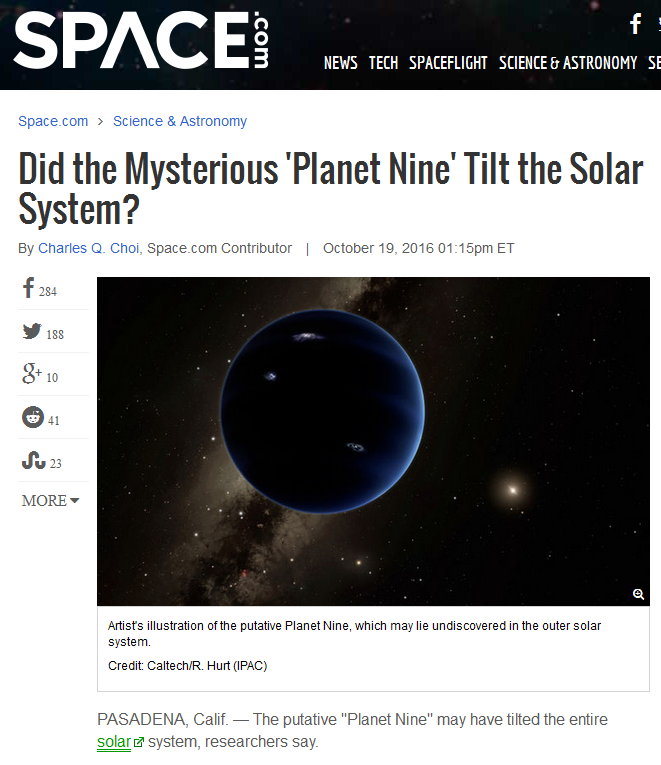 This entry was posted in Extraterrestrials, NWO on October 21, 2016 by kenneth. …Let’s have a look at what happened. Upon reading it, my inner guidance gave me a thumbs up. But since it was on a website run by religious weirdos, I decided it would be best if I verified its major points for myself. So over the course of the next few days, I’ll show you what I found. Then we’ll arrive at a rational, commonsense conclusion based on the available evidence. “Marrano, in Spanish history, a Jew who converted to the Christian faith to escape persecution but who continued to practice Judaism secretly. It was a term of abuse and also applies to any descendants of Marranos. The origin of the word marrano is uncertain. “Alonso de Hojeda, a Dominican friar from Seville, convinced Queen Isabella of the existence of Crypto-Judaism among Andalusian conversos during her stay in Seville between 1477 and 1478. A report, produced by Pedro González de Mendoza, Archbishop of Seville, and by the Segovian Dominican Tomás de Torquemada, corroborated this assertion. In 1480 a plot to overthrow the government of Seville under armed insurrection lead by Don Diego de Susona, a wealthy merchant converso was discovered and suppressed. 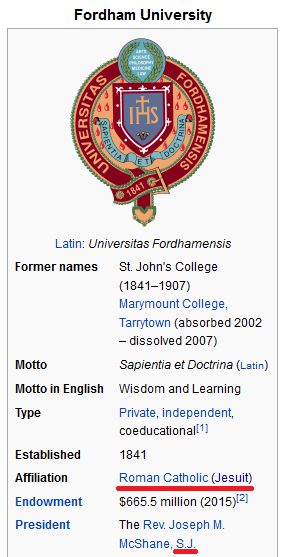 Was Ignatius really a Crypto-Jew / Marrano / converso? 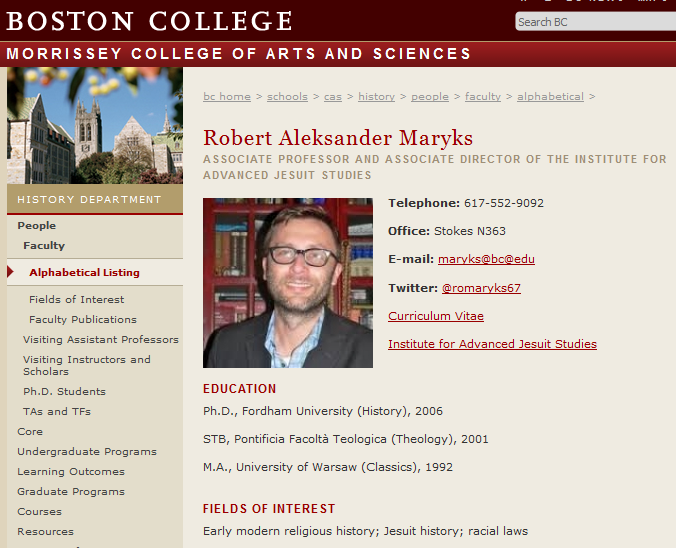 …from Fordham.UniversityPressScholarship.com. If you look to the “S.J.” in the names of the authors, it refers to the Society of Jesus; both the listed authors are Jesuits (I’ll cover other points from this book description later). 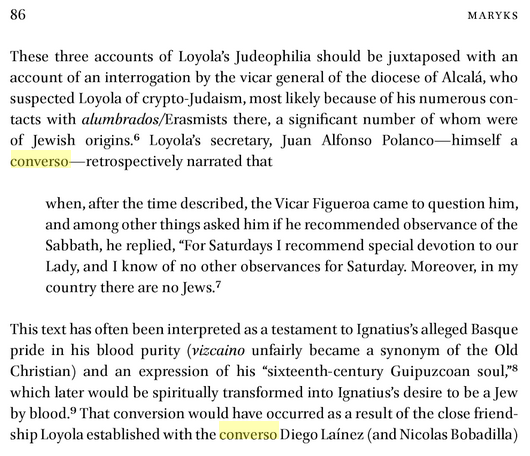 So as you can see, the Jesuits do not dispute that Ignatius came from a converso family, although they do gloss over the obvious implication that Ignatius himself was a Crypto-Jew. They also attempt to spin away the pervasive Crypto-Jewish nature of their Order (while simultaneously heaping praise upon the Jews). Again, I’ll get back to that later. Under threat of torture and death by the followers of Jesus (who were the descendants of the Romans who slaughtered and scattered the Jewish people in Judea), how many conversos sincerely converted to Christianity and suddenly held a love for Jesus in their hearts? The answer to this question is “few to none.” You can call the Jews many things, but “pushovers” isn’t one of them. When their opportunity to convert or die arrived, the strident Jews were tortured and killed, the practical Jews fled, and the stubborn, strong Jews stood their ground and said, “Yeah. Sure. We’re Christians now.” But as that last group, the conversos, professed Christ with their tongues, their hearts professed something else: their Jewish identity and a desire for revenge. 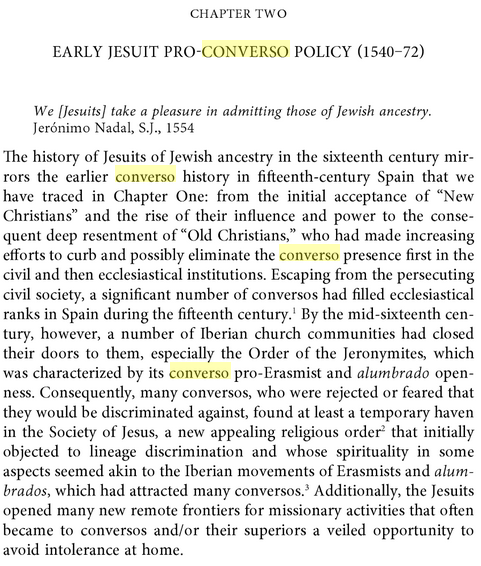 That being said, “converso” DOES equal “Marrano / Crypto-Jew,” because virtually no Jews would ever embrace a bastardized / Romanized version of their religion forced upon them by the enemies of their people. Almost all conversions were done for practical purposes, not out of a real realignment of faith. A. 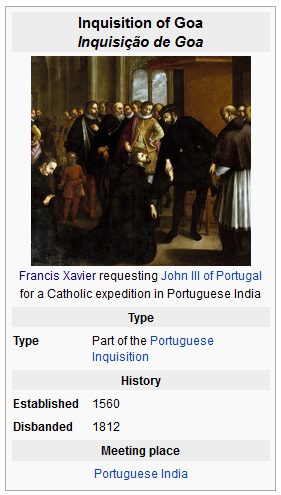 The Jesuit version – Ignatius did have a Jewish family background, but his family was among the “good” conversos. When they were told to “convert or die” during one of the many pogroms that occurred before and during the Inquisition, his family realized the err of their Jewish ways and repented of them. They cast aside their Jewish identity and embraced a true love of their savior, Jesus Christ. It was with this pure-hearted love of Christ that Ignatius begat the Jesuit Order. B. This blog’s version – When Ignatius’ family faced their “convert or die” or “convert for acceptance and gain” moment, they told the Christians what they wanted to hear. But secretly, they maintained their Jewish identities and practices like virtually all Jews did. So when Ignatius put together the Jesuit Order, he had on his mind what all Jews had on their minds: seeking shelter from the persecutors and seeking change to put an end to the persecution. Which narrative do you find more realistic? 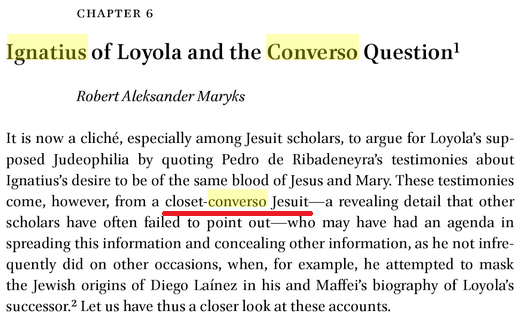 If your answer is “the Jesuit version,” stop reading this entry now and go find something else to read. The rest will be of no benefit to you. But if your answer is “this blog’s version,” let’s keep going. 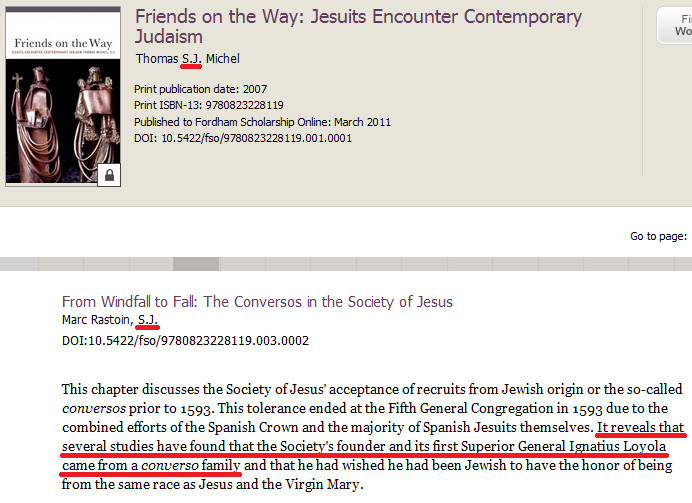 Did any other Crypto-Jews / Marranos / conversos join the Jesuit Order? So did this new order of Crypto-Jews escape the attention of other members of the Catholic hierarchy? No, they did not. From this passage, we see that the “Old Christians” (traditional non-converso Christians) within the Church “suspected Loyola of Crypto-Judaism” so much that at least one investigation was mounted against him. Maryks also mentions “Ignatius’ alleged Basque pride in his blood purity.” I’ll get back to that a little later. And by the way, the “Alumbrados” of “Jewish origins” with whom Ignatius had “numerous contacts” translates to “Illuminated.” Now isn’t that a little foreshadowing of things to come. 1) It speaks of the Jewish infiltration of civil and ecclesiastical institutions that gave rise to a protective backlash against the conversos. From the perspective of the Old Christians, they saw an insidious takeover of their society taking place, and it had to be stopped (we Americans know exactly how that feels). They were right of course. But from the perspective of the “New Christians” (the conversos), they perceived the Old Christians as engaging in persecution against them, and they too were right. Looking at it rationally, the Old Christians had no reason to complain; they forced the Jews into their religion, so they fully deserved what was coming to them. They brought “the Crypto-Jewish virus” in by their own hand. 2) It confirms that conversos did see the clerical ranks of the Church as a haven from persecution, although Maryks fails to mention the other obvious motivation the conversos had in becoming clergy: ending the persecution of their people by changing or even taking over the Church once they were on the inside. 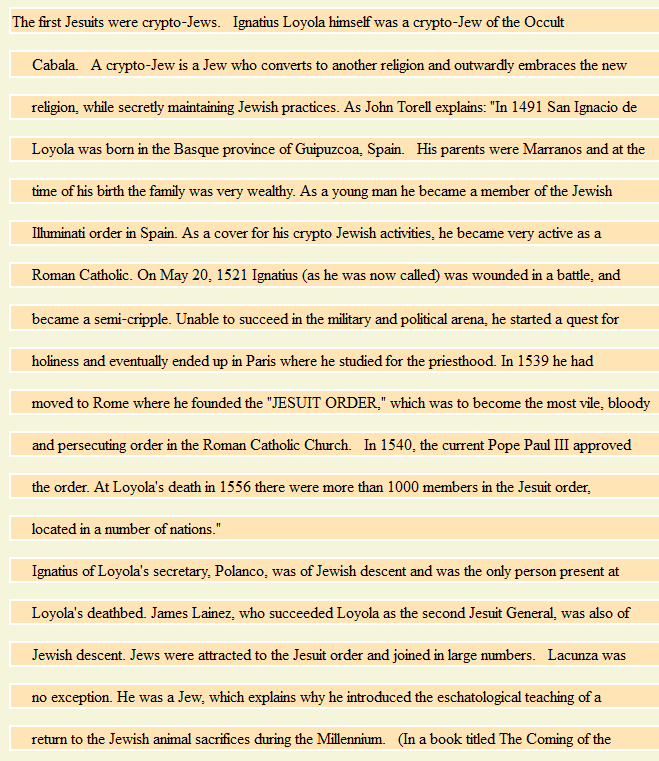 3) It points out that Crypto-Jews penetrated other orders of the Church. It is standard Jewish operating procedure to infiltrate all factions within an institution for the purpose of monitoring their activities and taking control if possible. 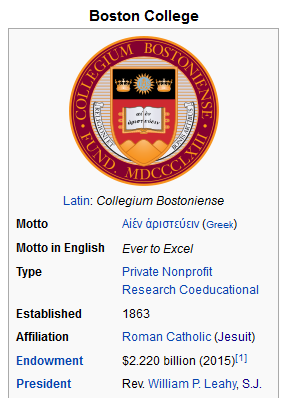 They didn’t need to take over the Jesuit Order, though. It was theirs from the very beginning. It was their hand within the Church. 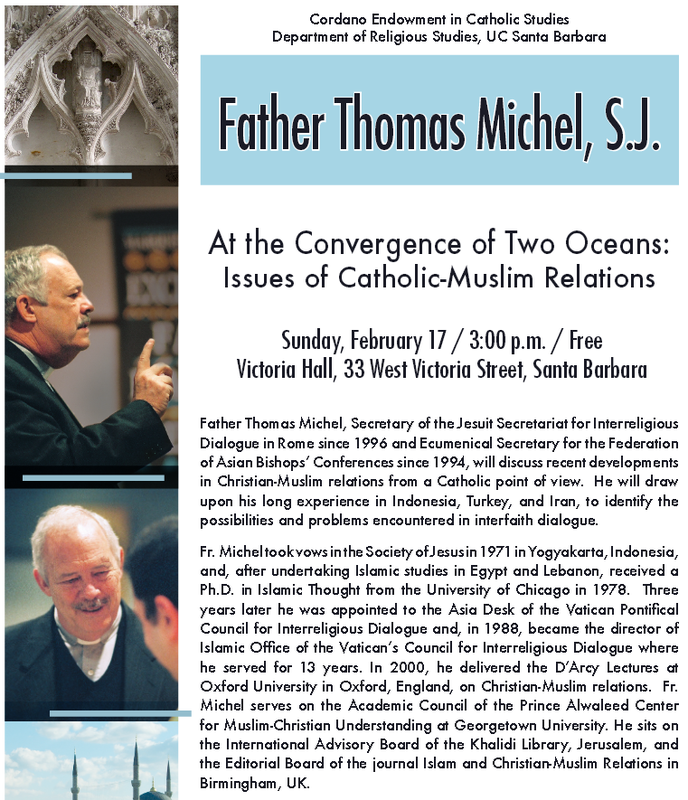 It is here where we’ll take another common sense break and put ourselves in the shoes of the Crypto-Jews of the early Jesuit Order. 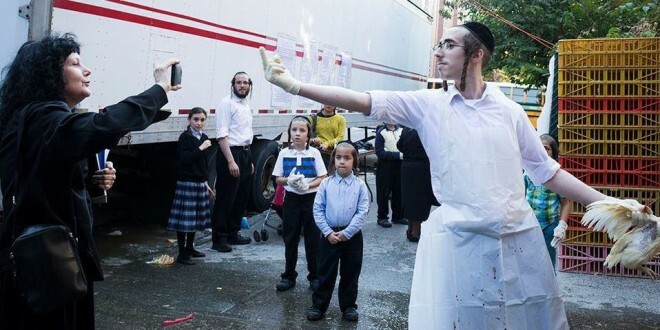 Upon doing so, we find that we’re facing a worsening environment in which our Order is suspected of being a synagogue of Jews, and blood purity laws are popping up to stop conversos from taking positions in civil society and the clergy. What do we do? Do we give up, go home, and cry in our Manischewitz? Or do we make adjustments to allay suspicion and get around the blood purity laws? 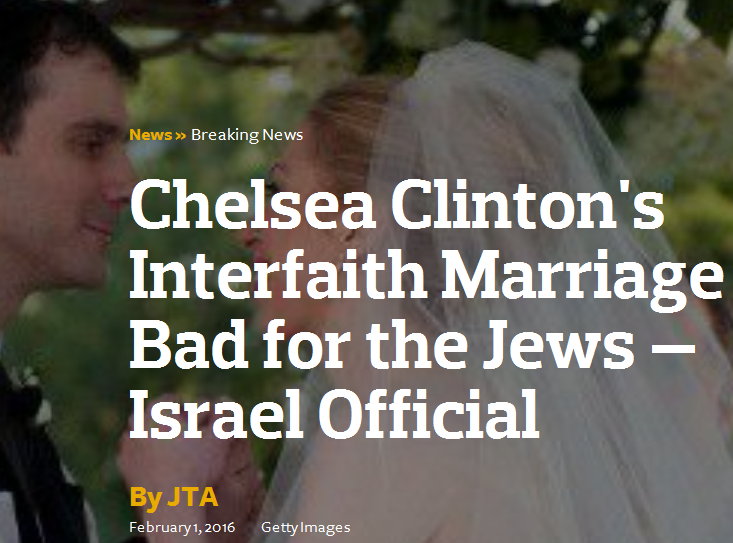 Being Jews, the choice is obvious: we adjust and move on – we never give up. After thinking about it, these are the specific things we’d do to keep going…. …By leading the effort against ourselves, we can control where the investigations go, and we can shield our core operatives while staging controlled sacrifices (such as in a faraway place like Goa, India) to make it look like we’re making progress. 2) We would double-down on our efforts to pose as the most rabidly loyal order in the whole Church. This would place us above any suspicion of being subversives. If we want to sneak around as Jews and change the Church, we must stop acting like Jew-lovers and start acting like the complete opposite. People will find it incomprehensible that we are Jewish influencers if we outwardly act like we are against Jewish influence. A. The Jesuit version – The Society of Jesus enacted a very strict purity of blood law in 1593, and it was faithfully observed. This resulted in the end of the Order’s liberal period, and the converso presence within the Society waned. The Order then went on to centuries of strict adherence to Catholic doctrine and faithful service to the Church. B. This blog’s version – The Society of Jesus responded to its increasingly hostile environment by putting on a show of casting out conversos and blocking them from entry. But in reality, they had ways of dodging blood purity laws, and they kept bringing in Jews under deep cover. With the financial assistance of the “Court Jew” money-men outside the Church, the Order then spent centuries spreading its tentacles both within the Church and around the world, eventually taking over the Church entirely. Which narrative do you find more realistic? 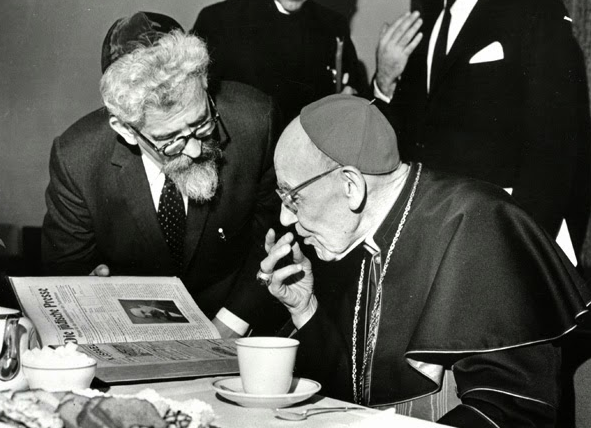 By the late 1950’s, the Crypto-Jews had amassed enough power within the Church to be able to remake it in their image, making it more worldly and cosmopolitan. And they officially began the process on 11 October 1962 by convening the Second Vatican Council. >>> Perhaps the biggest of these changes came in the church’s approach to Judaism. Before Vatican II, Jews were stigmatized as the people who killed Jesus Christ. That changed with the council, when the Catholic Church acknowledged its Jewish roots and Jews’ covenant with God, Ryan said. And can you guess who led the effort in the Council to change the Church’s stance on Jews? >>> Augustin Bea, S.J. (28 May 1881 – 16 November 1968), was a German Jesuit priest and scholar at the Pontifical Gregorian University specialising in biblical studies and biblical archeology. He also served as the personal confessor of Pope Pius XII. I’m sure you can imagine how traditional Christians feel about this change in Vatican policy. B. 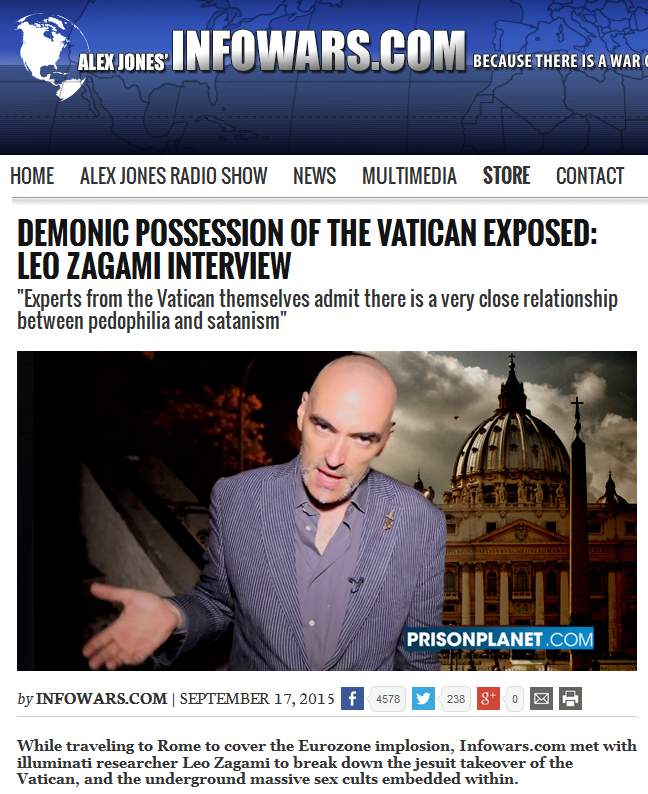 This blog’s narrative that the Jesuit Order was created as an instrument of Jewish infiltration and subversion of the Roman Catholic Church, and it has succeeded in taking over. Now that we have a basic understanding of the past, it’s time to look at what the Jesuit Crypto-Jews are doing now. By blaming the takeover on “Satanic” forces, which play the “bad guys” in the Christian spiritual dialectic, they are establishing the traditionalist Christians as the “good guys.” But in reality, there are no good guys to be found in the whole drama. The Roman Catholic Church was created by the Roman imperial elite as an instrument of spiritual control over their subjects. It is a man-made religion and an abomination, and it always has been. All that happened with the Jesuit takeover is that Jewish elite monsters took over from Roman elite monsters. The reason the globalists are casting this battle as one between “Christian forces of good” and “Satanic/Jewish (‘Synagogue of Satan’) forces of evil” is so their god-king figure can sweep in, defeat the “Satanic” forces, and look like the good guy. So do not be confused by their disinformation; both sides of the spiritual dialectic are manned by the same bad guys, and the final “Jesus Christ” who shows up will be nothing more than a front man for the Crypto-Jews. In a P.S. 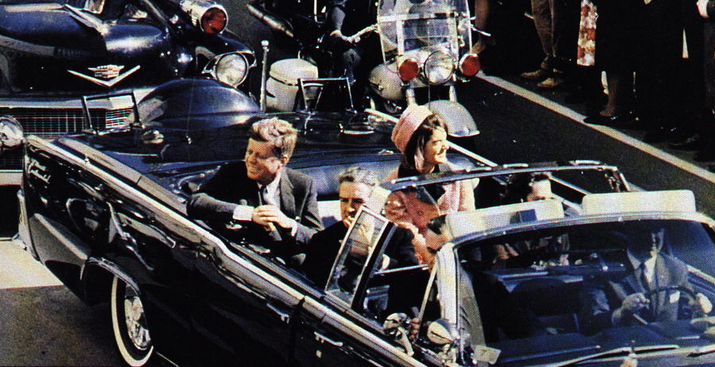 I’ll post later, we’ll have a look at the possible connection between the Second Vatican Council and the assassination of JFK. I’ll also post a P.S. that gets back to those things I said I’d get back to later. This entry was posted in Vatican on October 10, 2016 by kenneth.